Pacific Garden Mission strives to serve a hot, nutritious breakfast, lunch and dinner free of charge every day of the year for any hungry man, woman or child who walks through our doors. 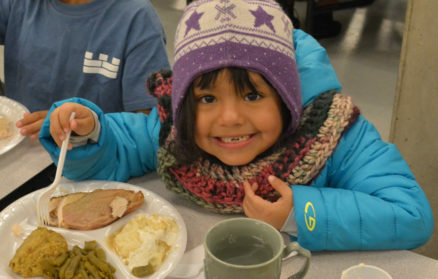 For the homeless, survival is day to day, so we feed the homeless in Chicago three meals a day—approximately 2,000 meals a day—365 days per year. Food donations to the Mission help us meet an individual’s immediate need of hunger and allows us to build relationships. Gospel service is held prior to each meal. Special holiday banquets are also provided at Thanksgiving, Christmas and Easter. Food donations may be brought to the food service entrance at the 14th Place receiving dock. We accept fresh bulk food donations and recommend calling ahead. If you are interested in donating food, please email Chef Floyd Turnbull turnbullf@pgm.org, or call (312) 492-9410. You can also make a financial donation to the homeless. Thanks to the generosity of our clothing donors we are able to clothe men, women, children and infants here at Pacific Garden Mission. Nothing is resold. We accept clothing donations of clean, good quality at the curbside of the 14th place entrance. Large quantities can be picked up by emailing Patrick Doolan, logistics manager doolanp@pgm.org. Clothing donations including shoes, undergarments, linens, blankets, and towels are sorted by size and color and re-distributed sometimes as fast as they are received. Please also consider making a financial donation to the homeless.